Dr. Nolubabalo Nqebelele has attained a PhD in Nephrology, making her a specialist in Chronic Kidney Disease. Dr. Nolubabalo Nqebelele has attained a PhD in Nephrology, making her a specialist in Chronic Kidney Disease (CKD). Her achievement makes her the first Black woman to earn a PhD in Internal Medicine at the University of the Witwatersrand, a top South African college. In her career she has won several local and international medical awards and scholarships. Some awards include the Noristan Award for Best Medical Student in 1995 and the Ken Huddle Clinical Role model award 2018. In the same vein, her research has been recognised by various institutions including, the South African Medical Research Council's National Health Scholarship Programme, the US-based Carnegie Foundation, the AstraZeneca Research Trust, the David Hepburn Memorial Award and the KwaZulu-Natal Kidney Foundation and National Kidney Foundation/Adcock Ingram Research grant. In an article on published on Wits University's website Nqebelele said, "There have been many women before me who could have achieved the same qualification. Women doctors face social pressures and professional prejudices on their path to becoming specialists." She strongly feels that the way to remedy this deficit is through mentoring. "Even though it is not easy to be what you haven't already seen, a mentor's encouragement makes a big difference. Because women are traditionally encouraged to pursue non-science careers, when one person stands out, that inspires others. Even though the road is tough with barriers and hurdles, winning against many odds inspires others to dream; to have limitless ambition." 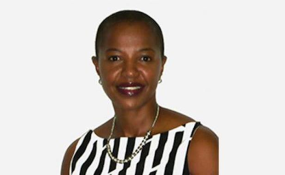 She herself is a host mentor for the International Society of Nephrology's Fellowship programme and has mentored doctors from Uganda, Mozambique, and Nigeria who have become Fellows of the International Society of Nephrology. "As in many professions, women's determination and passion are the qualities needed to deal with cultural prejudices. Having supportive family and friends is also critical", says Nqebelele. "We need buffers to cushion us after long hospital hours, and often with very limited resources. A special ring of caring individuals is important to support women doctors to believe in themselves and persist beyond the challenges. It encourages us to keep working hard." Nqebelele is passionate about social justice in health care saying physicians, "Must pursue universal health care for everyone as a fundamental human right. The unacceptable inequalities in health care are a moral, political, social, and economic obligation of every doctor." "When a patient walks into a clinic, they not only walk in with an ailment but everything else in their world that impacts their health. When an institution does not provide equal health care to everyone and does not relentlessly work and make changes, it is committing structural violence against its clients. We must not stand by and say there is nothing we can do. While making a difference to one person is great, imagine making a difference to everyone who walks into a hospital. That must be our goal and vision as doctors," she continued. In the article Nqebelele said if she were the health minister for just one hour, she would make drastic policy changes to ensure equity, equality and universal access to dialysis for all kidney patients, "Getting kidney dialysis in South African is often a matter of chance; like a lucky draw. The criteria for selecting which patients go for dialysis is interpreted in different ways. Being selected for dialysis depends on who is interpreting the criteria - today you can be luck but tomorrow your luck could run out."